Accusations Of Corruption Rampant In Afghanistan Convictions are rare in Kabul, facts are elusive, and many say arrests are not possible. Several figures seen as key to fighting corruption have themselves faced charges in recent months, leaving the Afghan public to wonder whether the accused have been caught red-handed, or perhaps were getting a bit too close to catching someone who really is guilty. As the U.S. tightens its belt, some in Congress are calling for more scrutiny of the budgets Americans are boosting abroad. Last week, Vermont Democrat Peter Welch called on Congress to investigate corruption in Afghanistan, where the U.S. is spending billions of dollars. It might have surprised him to know that a similar conversation was happening in the Afghan legislature. In a moment of candor, Afghanistan's deputy attorney general said he had arrest warrants for high-ranking government officials, but he feared arresting them. In Kabul, accusations of corruption are frequent, but convictions are rare. Afghans say they encounter corruption at every turn — from paying their electricity bill to electing their president. They discuss it constantly, but not usually in such a public forum as an open session of Parliament. And it's not usually the deputy attorney general doing the talking. "A deputy minister of this government has been sentenced to five years by a court of law," said Deputy Attorney General Rahmatulla Nazari. "But to go and arrest him, we would need a battalion of policemen. We admit it — we have these kinds of problems arresting high officials. If we were to go and arrest him, there would be shootout and a bloodshed, and innocent people would die." Nazari later said at least 20 corruption cases on his docket involved senior government officials, but because many of them are warlords with armed militias, it's not possible to arrest them. 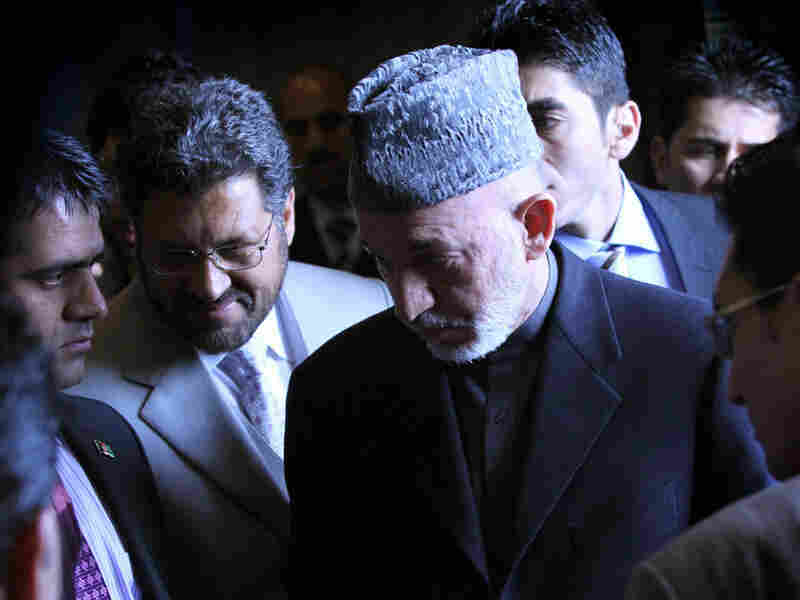 The anti-corruption line surprised many because the attorney general's office is widely perceived as a staunch ally of President Hamid Karzai. For example, last month a prosecutor detained Nurullah Delawari — a close adviser to President Karzai — but he was promptly released after an angry call from the presidential palace, according to a source at the attorney general's office. As with many corruption cases here, the facts are elusive. Delawari says he is guilty of no crime, and was simply questioned about another case. "When I came out, I heard a lot of these news media and televisions with my pictures saying that [I] was arrested and charged with embezzlement of $3 million," he says. "I was shocked to hear this because my reputation is more important than this job or being an adviser to the president." Delawari says Afghanistan's judiciary system is all accusation and little evidence. And that is leading to an atmosphere where corruption allegations have become a political weapon, says Rangin Spanta, Afghanistan's national security adviser. This winter, a diplomatic cable released by WikiLeaks alleged that Spanta had taken millions in bribes. There was no evidence, and the U.S. embassy publicly supported Spanta — but the accusation is still out there, he says. "Unfortunately, this accusing people to be involved in corruption, this is also a weapon to eliminate the politician in life, also to eliminate the dignity of the people. This is a bad thing and make our fight against corruption not easier," he says. Several other figures seen as key to the fight against corruption have found themselves facing charges in recent months, leaving the Afghan public to wonder, with each new case, whether the accused was caught red-handed, or perhaps was getting a bit too close to catching someone who is really guilty.